Believe it or not, the end of summer is upon us. The cycle of seasons is moving around, once again leaving behind berries, melons and corn in favor of not berries, melons or corn. It’s hard not to feel disheartened by the sight of withered tomato plants, bare fruit trees, and cucumber vines holding one solitary remaining cuke that even the slugs won’t touch. However, if the midst of summer’s decay, there shines a beacon of hope; a reminder that all that glitters is not gold— it’s often purplish-brown on the outside and blood-red on the inside. I speak, of course, of the humble fig. 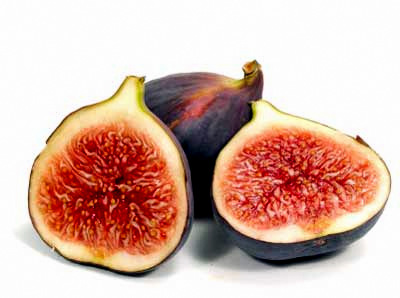 If the first thing that enters your mind when I say “fig” is Newton, I’m going to have to ask you to back away from the cookie aisle and join in me in the fresh produce section where this divine fruit belongs. The fig, as Wikiopediea explains, is a species of flowering plant in the genusFicus, from the familyMoraceae, known as the common fig, or just the fig. It is the source of the fruit also called the fig, and as such is an important crop in those areas where it is grown commercially. Native to the Middle East and western Asia, it has been sought out and cultivated by man since ancient times, and is now widely grown throughout the temperate world, both for its fruit and as an ornamental plant. Historically, we find the fig in the Garden of Eden, the Buddha attained enlightenment while sitting under a fig tree, the prophet Muhammad called it a fruit “descended from paradise” and it’s the only thing that grows in the Verano garden with almost no help from our less than green thumbs; a true miracle. My wife, Kathy, and I stumbled upon bacon wrapped figs with feta and pecans while visiting Cape Cod recently. As we devoured these appetizers, we realized that they could be made ala Off the Vine. We promised ourselves that when we returned home, and the haze of our lobster-fest wore off, we would make them using only the freshest ingredients to include OTVM bacon, feta, and arugula. Try them yourself and I promise you will never eat a Fig Newton again, unless it’s wrapped in bacon. Place 1/2 cup of balsamic vinegar in a small sauce pan and bring to a low boil. Reduce to a simmer and let stand on heat until reduced by at least half. The longer you let is simmer the thicker and sweeter the reduction will become. Remove from heat. With a sharp knife, slice a small hole into each fig. Take a roasted pecan and place in center of fig. Take a small portion of feta cheese, slightly smaller than the pecan seems to work best, and place into the middle of the fig. Wrap 1/3 of a slice of bacon around the stuffed fig and carefully place on skewer. Place the skewers on a broiling rack and place at top setting. Broil until bacon begins to crisp and then carefully turn skewers over to crisp the bacon on the other side. Remove from oven and let stand to cool for a few minutes. Arrange salad greens on a plate and place 4 figs on each plate. Drizzle the balsamic reduction over top of figs and greens and serve.